Few experiences embody the excitement of the holidays like enjoying a display of bright, twinkling Christmas lights and meticulously-designed decorations. 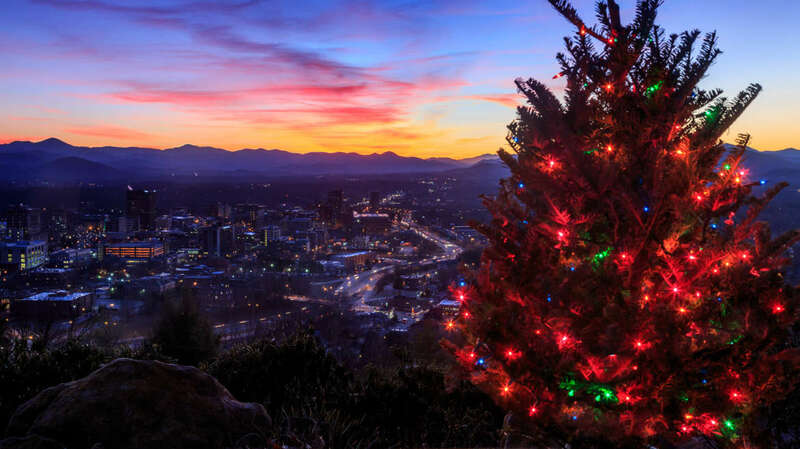 Visitors to Asheville, N.C. can enjoy these dazzling, family-friendly light shows that are sure to inspire the spirit of the season. It’s one of the newest light displays in Asheville and it’s also one of the brightest.Winter Lights at the North Carolina Arboretumfeatures 500,000 energy-efficient LED lights throughout the nationally-known gardens. A special highlight on this walking-tour is the 50-foot animated tree that comes alive to music. Kids will delight at the Rocky Cove Railroad garden-scale model train and the “Storytime at Woodland Cove” program about animal hibernation in the winter. While visitors take in the sights, they can enjoy hot cocoa and snacks along their tour. The Arboretum is also hosting a new display in Asheville, helping to make the season extra bright in downtown. The new light display, Winter Lights Downtown, is centered around the Vance Monument and Hoss Haley Fountain in the heart of the city. Large trees are lit up in Pack Square with seven seasonal colors on rotation that make for a great show while shopping and dining downtown. Speaking of shopping, head over to the historic Grove Arcade, which has decked its halls with holiday decor inside and out for the Winter Wonderland celebration. Enjoy the lights from the comfort of your car along a two-mile stretch that is filled with hundreds of thousands of lights set to Christmas tunes on your own car radio. 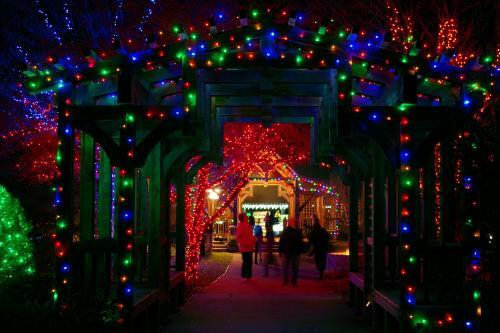 The carefully-crafted maze of lights of Shadrack's Christmas Wonderland at the Western North Carolina (WNC) Agricultural Center uses some of the top technology to provide an especially whimsical experience. New this year is Santa’s Village where visitors can refuel with treats and refreshments and take pictures with Ol' St. Nick himeself. Another local favorite drive-thru light show, Lake Julian Festival of Lights, illuminates a popular Buncombe County park. The road circling the park becomes a magical journey through tunnels of dazzling lights with 50 animated and stationary light displays. Visitors enjoying the lights will also be supporting a good cause – 20 percent of ticket sales are donated to Buncombe County Special Olympics. From the moment visitors see the lighted Lodge Gate at the entrance to Biltmore, they know they are in for a treat. What awaits inside the gate is a classicChristmas that hearkens back to the days of the Vanderbilts. A giant 55-foot Norway spruce strung with 55,000 lights on the front lawn leads the way into the home where 60 more intricately-decorated trees highlight the Christmas at Biltmore celebration. The 30,000 lights and 150 candles inside the home are particularly magical at night during the Candlelight Christmas Evenings at Biltmore tour. Just outside of the Biltmore sits historic Biltmore Village with its stone streets, quaint boutiques, and inviting restaurants. The Village lights up during the holidays with 250,000 bulbs outlining the buildings. Streetlamps are decked out with Fraser Fir holiday wreaths and more than 1000 luminaries line the streets. On the nights of Dec. 2nd and Dec. 3rd, the Village is transformed for the annual Dickens Festival. Shopkeepers dress in Victorian-era garb and the main stage is filled with musicians, choral groups, singers and dancers. 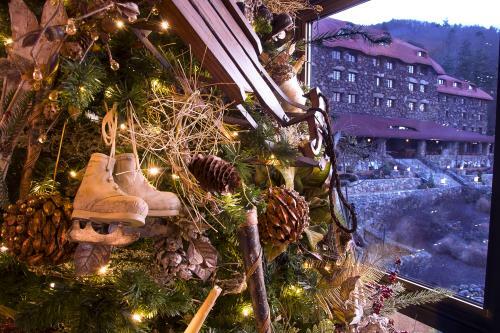 There are few places that offer the coziness and warmth of the season like the Great Hall at The Omni Grove Park Inn. Lighted wreaths adorn giant fireplaces with welcoming rocking chairs just waiting to transport visitors to holiday relaxation. Dozens of decorated trees brighten the halls of the Inn. Grab a mug of salted caramel hot chocolate as you enjoy viewing the more than 150 entries in the National Gingerbread House Competition. One of Asheville’s most beautiful shopping areas, Biltmore Park, glows at night with tens of thousands of lights. Beautiful lighted trees line the sidewalks in front of the many stores and restaurants. 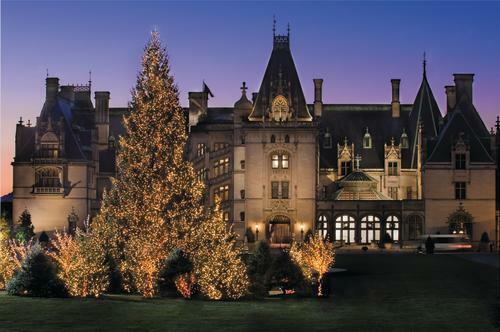 Biltmore Park rings in the season on Dec. 3rd with a special event, Holiday Magic & Memories, featuring entertainment and family-friendly activities. Top photo by Jared Kay. Winter Lights photo by Mark File. Omni Grove Park Inn photo by Charley Akers.